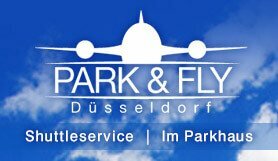 No matter if you plan a leisure or business trip, the Park & Fly parking offers are the easiest and fastest way to park your car at Düsseldorf International Airport. The Park & Fly staff parks your car when you arrive at the car park and will hand it back to you in excellent condition upon your return. The transfer of the car is insured and the air-conditioned shuttle bus to terminal A and back is free of charge. The car park is only 1 minute away from Düsseldorf International Airport. This parking service offers a 24 hours hotline and transfers, trained staff as well as car wash and repair services. The fee dor the covered parking is 10€ and will be paid at the carpark.